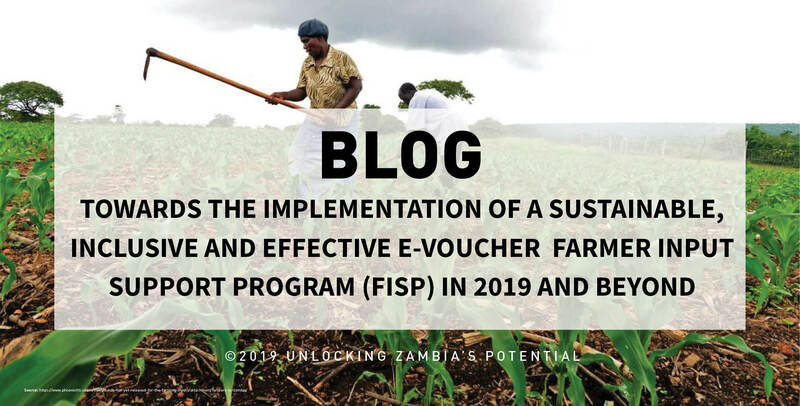 The Electronic Voucher Farmer Input Support Programme (e-Voucher) was fully implemented during the 2017/2018 farming season after a successful pilot of two farming seasons before. There have been notable implementation successes such as; reduced Government expenditure associated with procurement, transport and storage of inputs. The other successes relate to increased private sector participation in input distribution, beneficiary farmers have wide options of agriculture, livestock and fisheries inputs to choose from and an improvement in beneficiary targeting among others successes. However, e-Voucher FISP implementation also faced challenges notably; delays in Government funding; complications in deposit capture due to lack of physical presence by some contracted banks in some districts, poor internet connectivity and poor flow of beneficiary information among other challenges. Consequently, Government was prompted to vary FISP implementation in the current 2018/2019 farming season with fifty-four districts reverted to the old Traditional Direct Supply of inputs while sixty-one districts, have been maintained on the new e-voucher FISP. PMRC has noted remarkable improvements with the Zambia Integrated Agricultural Management Information System (ZIAMIS) platform performance which previously was characterized with systems crashes, stakeholders’ competence limitations in the use of the code system and slow processing time. ZIAMIS system improvements and other interventions by he the Ministry of Agriculture has led to enhanced beneficiary targeting with over 900,000 farmers making the K400 contributions by December 2018 after being given Authority To Deposit (ATD). Late payments to suppliers under the ‘Direct Supply of Inputs FISP mode’ who in some instances opted to withhold input stocks. Late payment and backlog of pending payments to some agro dealers which has affected their cash flow and consequently affected operations with some being forced to suspend operations. As PMRC we earnestly propose to the Government to re-strategize the funding modalities of the FISP and consider Upfront complete funding of the entire programme as opposed to the phased funding to assure programme reliability and prompt agro-dealer payment starting with the current farming season. This would ensure sustainability. To further develop agricultural produce marketing capacity in remote areas and increase the volumes of agricultural produce traded and facilitate fair prices leading to better profits and income to smallholder farmers, Government needs to focus attention on the state of feeder roads in addition to high-ways that have received considerable attention. To ensure effective linkage between the small-holder farmers and markets, Government through the Road Development Agency (RDA) should conduct routine grading of feeder roads. The effective implementation of FISP given the favorable rainfall forecast for this season should be anchored on reliable and timely funding and resolving other perennial challenges in the sector. This will not only guarantee a bumper harvest to ensure food security but also guarantee peoples’ livelihoods. Effectively, Food Reserve Agency (FRA) will be in a position to meet 500,000 metric tonnes of maize crop strategic reserves. The country will also have enough crops to export and do away with the costly export bans and administrative export restrictions that deprived the country of the much-needed foreign exchange. Government should prioritize disbursement of funds with upfront payment to FISP program. The Government needs to formulate exit strategy for the farmers currently on the FISP programme given the improved beneficiaries’ information storage and processing through the Zambia Integrated Agriculture Management Information System (ZIAMIS) database. This will enable Government to cater for as many eligible farmers as possible in the future. Government should also prioritize the maintenance of feeder roads to link farmers to the markets to further develop agricultural produce marketing capacity. We encourage Government to continue with the review of districts reverted to the direct input supply especially those that have enhanced agro-dealer capacity so that they are taken back to e-voucher FISP.